Bucking a long-range trend of declining viewership, the audience for local TV news grew in all three major time slots in 2013. Viewership climbed 6% in the morning (5 to 7 a.m.) and 3% in the early evening (5 to 7 p.m.) newscasts, according to a new Pew Research Center analysis. The audience barely edged up—by .1%—in the late night slot (11 p.m.), a newscast that had suffered the biggest decreases in recent years. The good news comes after a difficult 2012 when late night and early evening audiences each dropped by 7% and the morning audience decreased by 5%. Indeed, viewership for all three slots had declined every year from 2008-2012—with the exception of a small uptick in 2011. Pew Research analyzes Nielsen Media Research audience data for all four major sweeps periods — February, May, July and November — and computes national averages for each time slot. The jump in viewership in the key timeslots was due largely to significant increases in the November sweeps period when morning news was up 12%, early evening grew by 8% and late night increased by 6%. While it is impossible to know whether the 2013 numbers are a harbinger of a new spurt of audience growth, they coincide with a wave of consolidation that has seen bullish media companies—from Gannett to Tribune—buy up large groups of stations. One likely reason for the 2013 audience growth was the number of major news events that broke during the sweeps periods. In November, the month with the biggest audience increase, the troubled launch of the President Obama’s health care website was big news as was news coverage of big weather events, including tornados in the Midwest, and floods in Texas, Louisiana and Mississippi. In February, the manhunt for Christopher Dorner, the former Los Angeles police officer who went on a killing spree, generated big audiences in the nation’s second-biggest TV market. That same month marked the resignation of Pope Benedict XVI, the first pontiff to step down in nearly 600 years. While the 2013 numbers are encouraging, the overall trend in local television news audience has not been positive. Even including 2013, the morning newscasts—the most consistent viewership performer in local news—has lost 3% of its audience since 2007. 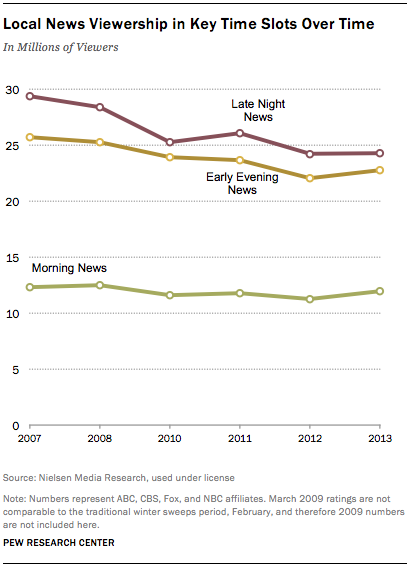 The decrease from 2007-2013 in early evening news viewership has been more dramatic—12%. 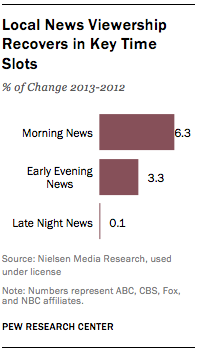 And overall, the late night newscasts have lost about one-sixth of their viewers (17%) in that time period. Still, local TV remains a top news source for Americans, with almost three out of four U.S. adults (71%) watching local television news, compared with 65% viewing network newscasts and 38% cable news over the course of a month, according to our analysis of Nielsen data from February 2013.